LiquidSonics’ Seventh Heaven is dedicated to the reproduction of thirty of the best reverbs from the legendary Bricasti M7 in an incredibly easy to use and extremely powerful native reverb plug-in. Every preset has been meticulously sampled to provide unparalleled flexibility true to the original hardware to produce rich, organic reverbs of up to thirty seconds with full control over the early, late and very low frequency components. With Seventh Heaven thirty of the Bricasti M7’s finest ever reverbs are available at your fingertips. A selection of the best halls, plates, chambers, rooms, spaces and ambiences accessed through a single dial makes it incredibly quick and easy to find a beautiful reverb for any track from drums, to vocals to orchestral ensembles. Its simplicity belies the power within. The realism and quality achieved by the Fusion-IR processing is breathtaking, and the most crucial parameters of a reverb such as decay times, levels and delays are fully controllable freeing producers from many of the limitations associated with convolution technologies. 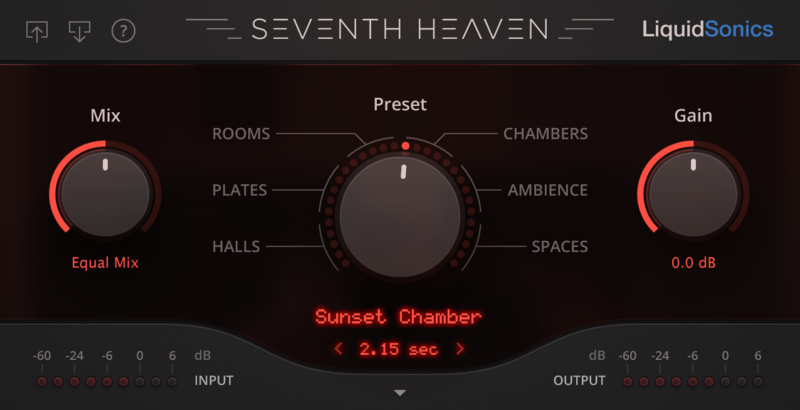 Seventh Heaven provides arbitrary reverb decay times from 200 ms up to 30 seconds for every preset – an unprecedented feat particularly for modulated convolution reverbs. A convolution reverb will typically be able to window a decay time with envelopes of varying complexity or by applying pitch/stretch control. However factors such as simulated room size, low frequency response and diffusion/density should be linked to decay time so traditional controls considerably compromise acoustic authenticity. Seventh Heaven solves such problems through extensive multi-sampling and intelligent interpolation algorithms. Judicious use of advanced data selection techniques and lossless compression technologies result in a similar disk space requirement to that of the original M7 Fusion-IRs. The relative balance of the early reflections and late reverberant field are of particular importance in any simulated acoustic space or device. Full control over these can be achieved with Seventh Heaven. The Bricasti M7 is notable for its special consideration of modulated low frequency reverb behaviour (200 Hz and below) independent of the algorithms governing early reflections and the late reverb. This frequency area is crucial to the accurate reproduction of many spaces, and accurate control of it is of great importance to many producers. The Reverberate 2’s Fusion-IR sets allow control over the early and late reverb components, but Seventh Heaven goes much further in providing more precise access to the level of all three reverb components. LiquidSonics’ proprietary sampling techniques and Fusion-IR convolution technology ensure accurate reproduction of all three reverb components. The customisable pre-delay and delay modules in Seventh Heaven respond in a manner true to the original hardware. The M7’s pre-delay control does not delay the entire reverb signal, so typical attempts to modify a sampled M7 pre-delay will not produce authentic or usually even desirable results. Modification of the hardware’s pre-delay only affects the very low frequency reverb and the late reverb, the early reflections stay close to the dry signal. For the first time this behaviour is faithfully reproduced providing much more control over any inherent pre-delays in presets or the addition of pre-delay in the very natural style of the original hardware. To add acoustic simulation properties or rhythmic vibe to the reverb a very easy to use delay module can optionally be used to re-inject signal into the late and low frequency reverb components. This operates at fixed level 6 dB below the nominal reverb. The delay and pre-delay can be set to synchronise to the host’s tempo using half, dotted and regular 1/32 to 1/4 notes. The use of a low and high pass filter is commonplace in reverb best practice (sometimes referred to as the Abbey Road technique). For such post equalisation requirements a high quality 2-band oversampled paragraphic EQ is provided featuring one low cut and one Massberg high cut filter. The revolutionary capabilities of Seventh Heaven have been achieved though meticulous multi-sampling and characterisation of the Bricasti M7. Thousands of pristine captures are combined intelligently to very closely match the sound of the original hardware. Never before has this level of focus, detail and control been possible in a convolution based product and combines to make Seventh Heaven the ultimate go-to reverb perfect for any mix. All installer files for Seventh Heaven are linked below. The demo and full version installers are identical. You may begin a functional demo using the iLok code below. The Seventh Heaven demo is available for free on macOS and Windows. The demo will function for 14 days and after this period audio will not be processed until a full license is redeemed and activated. The Windows installer for Seventh Heaven can be downloaded here. If the standard download links are under heavy load you may download an identical set of files from a different server. iLok License Manager software v4 and above is required to use Seventh Heaven v1.0.3 and up, and you may need up update your iLok firmware by synchronising the iLok in iLok License Manager. The macOS installer for Seventh Heaven can be downloaded here. A summary of changes to Seventh Heaven since release. This is an unofficial plug-in produced and distributed by LiquidSonics with the express permission of Bricasti Design Ltd. All Bricasti and M7 sample content and trademarks are copyright Bricasti Design Ltd. All software is copyright LiquidSonics Ltd. Product licensing is via iLok Cloud or dongle with a dual authorisation code delivered by email. An iLok must be purchased separately from an audio retailer if you do not already own one (these are not produced or supplied by LiquidSonics). No option for computer based licensing or Reverberate style license files is provided. The original bank of presets, these are typically the presets the M7 is most well known for (the numbers represent the source M7 preset number). All samples were recorded by LiquidSonics Ltd. (as such they are unofficial samples generated by LiquidSonics rather than Bricasti). The samples are copyright Bricasti Design Ltd. and are being distributed exclusively by LiquidSonics Ltd. with permission of Bricasti Design Ltd. The Seventh Heaven plug-in is copyright LiquidSonics Ltd.